^ Independent NASA Satellite Measurements Confirm El Niño is Back and Strong. NASA/JPL. ^ Climate Prediction Center. Frequently Asked Questions about El Niño and La Niña. National Centers for Environmental Prediction. 2005-12-19 [2009-07-17]. ^ K.E. Trenberth, P.D. Jones, P. Ambenje, R. Bojariu , D. Easterling, A. Klein Tank, D. Parker, F. Rahimzadeh, J.A. Renwick, M. Rusticucci, B. Soden and P. Zhai. Observations: Surface and Atmospheric Climate Change. (编) Solomon, S., D. Qin, M. Manning, Z. Chen, M. Marquis, K.B. Averyt, M. Tignor and H.L. Miller. Climate Change 2007: The Physical Science Basis. Contribution of Working Group I to the Fourth Assessment Report of the Intergovernmental Panel on Climate Change. Cambridge, UK: Cambridge University Press. : 235–336. ^ 4.0 4.1 Historical El Niño/La Niña episodes (1950-present). United States Climate Prediction Center. 4 November 2015 [2015-01-10]. ^ 5.0 5.1 El Niño - Detailed Australian Analysis. Australian Bureau of Meteorology. [2016-04-03]. ^ 6.0 6.1 El Nino here to stay. BBC News. November 7, 1997 [1 May 2010]. ^ Davis, Mike. Late Victorian Holocausts: El Niño Famines and the Making of the Third World. London: Verso. 2001: 271. ISBN 1-85984-739-0. 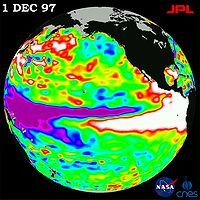 ^ Very strong 1997-98 Pacific warm episode (El Niño). [2015-07-28]. Caviedes, César N. El Niño in History: Storming Through the Ages. Gainesville: University of Florida Press. 2001. ISBN 0-8130-2099-9. Fagan, Brian M. Floods, Famines, and Emperors: El Niño and the Fate of Civilizations. New York: Basic Books. 1999. ISBN 0-7126-6478-5. Glantz, Michael H. Currents of change. Cambridge: Cambridge University Press. 2001. ISBN 0-521-78672-X. Philander, S. George. El Niño, La Niña and the Southern Oscillation. San Diego: Academic Press. 1990. ISBN 0-12-553235-0. Kuenzer, C.; Zhao, D.; Scipal, K.; Sabel, D.; Naeimi, V.; Bartalis, Z.; Hasenauer, S.; Mehl, H.; Dech, S.; Waganer, W. El Niño southern oscillation influences represented in ERS scatterometer-derived soil moisture data. Applied Geography. 2009, 29 (4): 463–477. doi:10.1016/j.apgeog.2009.04.004. Li, J.; Xie, S.-P.; Cook, E.R. ; Morales, M.; Christie, D.; Johnson, N.; Chen, F.; d’Arrigo, R.; Fowler, A.; Gou, X.; Fang, K. El Niño modulations over the past seven centuries. Nature Climate Change. 2013, 3 (9): 822–826. Bibcode:2013NatCC...3..822L. doi:10.1038/nclimate1936.